Both boys had football (soccer) matches today. Beautiful spring sunshine, instead of the more usual horizontal rain and biting east wind, meant that it was a pleasure to be outside being a Soccer Mom most of the day. I took my super-fancy borrowed camera along to Ed's end-of-season Dads vs Lads match, thinking I might take a picture or two. But as I manhandled the impressive-looking camera out of my bag, the nice man who edits the village website hurried over and asked if I would take photos they could use; he must have mistaken me for someone who actually knew what they were doing! But, I had a lovely time prowling up and down the side-line, snapping away. I managed a few action shots that weren't too embarrassingly bad (mostly due to the camera and the amazing lens - it focuses so fast!!) and sent them off. After the match. 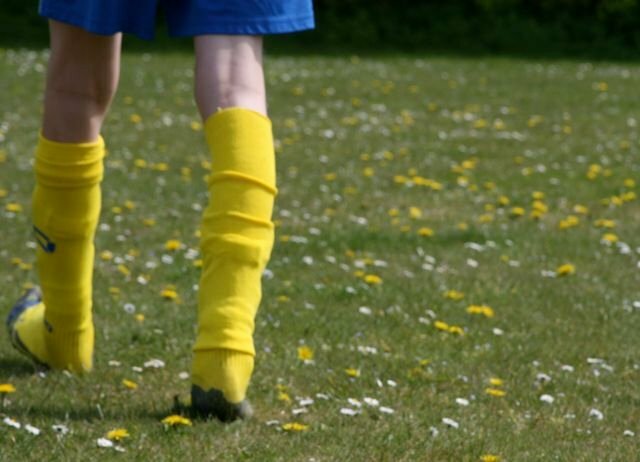 Ed had taken his boots off for some reason, and I love the way his football socks are the exact same shade as the dandelions! And it's kind of a worm's eye view (a worm on a stepladder maybe!). What a wonderfully selected frame for your image(s)! A delightful photo! Know they loved your photos. Am sure they turned out great! Love that yellow! Exact match for the dandelions! The yellow is so interesting. Creative picture! I love this shot! wonderful capture and love the bright yellow socks with the dandelions! Great job!! yaaaay! how lovely and happy! Love the colors and the composition. Great shot! I agree with Theresa--it works together so well! LOVE IT!